I recently came back from a two day trip out of town and this was the first news I heard when I got back. I thought it was a sick joke at first, but then it slowly sank in that it wasn’t the case. We lost a brilliant, enthusiastic man this year, and he will certainly not be forgotten. A true inspiration to Nintendo fans and gamers all around, Satoru Iwata, thank you for your major contributions to the gaming community. May your games continue to live on in our hearts and imagination. Thank you for honoring this wonderful man. It was a sad time when I had first got the news, almost yesterday, it seems, and everyone, no matter how hard they tried, was unable to lighten the mood of his death. It was a great shame, but even the best of us cannot hide from death. I know it's been a while since this happened, but I'll admit, he was a great guy. Like many other folks, he held a hidden role in my childhood that I have only now discovered. May he rest well. Looking at this makes me feel sad all over again. it was mostly a private affair. The wake and memorial had many people show up, including people from both Microsoft and Sony, expressing their sorrow at his loss as many were inspired by him to create video games themselves. Sometimes I turn on my Sega even though I have ps4 and strong pc. EN: Thank you, Satoru, you will be forever missed. BG: Благодарим Ви , Satoru , ще бъде завинаги пропусна . Mario didn't even eat that spaghetti when iwata passed away, and Mario LIVES for spaghetti. With those new wings, he can now be his own Kid Icarus. Truly a great loss. 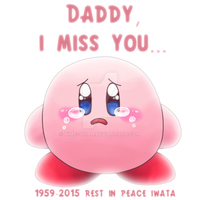 RIP Satoru Iwata. Lovely art for an amazing man. Wait, he's dead? How did I not hear about this?! This information suddenly got dropped on me, a few days ago. He was a good man, the good people always die first.